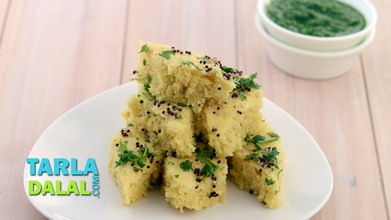 Tasty and fluffy dhokla is always known to be a versatile dish, which can be prepared with varied flours and by adding additional ingredients like veggies, corn, etc. 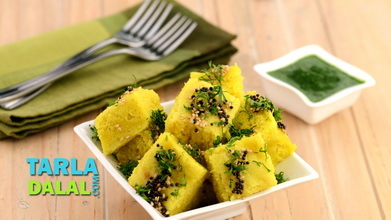 This scrumptious Cabbage Dhokla stands out from others in the equal use of grated cabbage and besan in the batter, an interesting move that adds a lot of crunch to the fluffy dhokla! 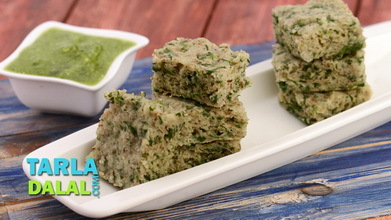 You will enjoy this multi-textured delight, flavoured with a traditional, aromatic tempering, and served with green chutney. 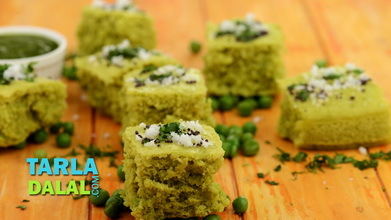 Combine the besan, cabbage, curds, chilli powder, a pinch of asafoetida, coriander-cumin seeds powder, turmeric powder and salt with approx. 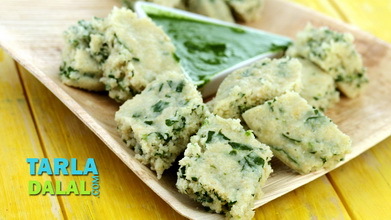 ½ cup of water in a deep bowl and mix very well to form a batter of dropping consistency. 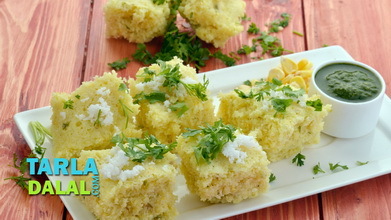 Just before steaming, add the fruit salt to the batter and sprinkle 2 tsp of water over it. Pour the batter into a greased 175 mm. (7”) diameter thali and steam in a steamer for 10 minutes. Keep aside to cool slightly. 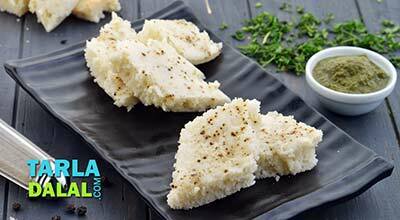 Heat the oil in small non-stick pan and add the mustard seeds, curry leaves and another pinch of asafoetida. 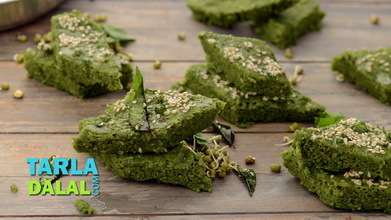 When the seeds crackle, add the sesame seeds and mix well. 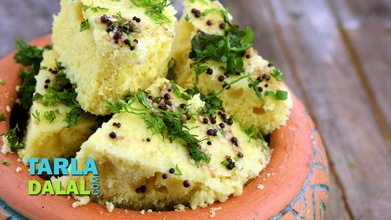 Pour this tempering over the dhoklas. Cut into equal sized square pieces.